Recap Shows: Starting this season, HBO will air a Game of Thrones recap show, After the Thrones, hosted by writers from the late, much lamented, Grantland website. Websites: One of the best websites to get Game of Thrones news, reviews, and more is Watchers On The Wall. They’ve been covering the Thrones since 2008 (keep in mind that the show didn’t air until 2011!). Communities: Want to talk to other Game of Thrones fans? 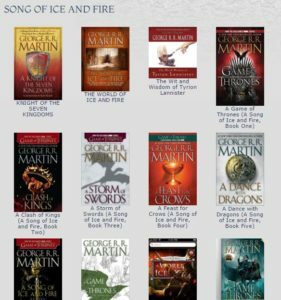 Consider joining one of the major Reddit communities devoted to either the show and/or the books. Podcasts: Listen to your fellow fans’ take on the show on podcasts like Cast of Thrones, Game of Owns, Fire & Lunch, Close The Door And Come Here, and A Podcast of Ice & Fire. Cons: If it’s not enough to watch the show, read about the show, talk about the show and listen to other people talk about the show, you could join fellow fans and cosplay as one of your favorite characters at one of the many fan conventions around the world. Video Games: Telltale Games has produced several episodes of an acclaimed Game of Thrones video game to tide you over in between seasons. 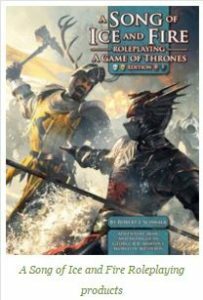 RPG: If you’re into more traditional roleplaying games, you’re in luck, as there’s also a Game of Thrones tabletop game! Food: Need recipes for your Game of Thrones party? Be your own Hot Pie and explore the Inn at the Crossroads food blog and dig into some honeyed chicken and lemon cakes. Art: The Game of Thrones fandom is filled with talented artists. Check out some of their work at the Gallery of Thrones on Tumblr. Music: Finally, to set the mood before Sunday’s premiere, listen to Ramin Diawadi‘s amazing score. If that’s not enough to rally the realm, nothing is!